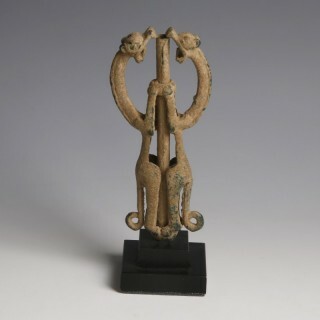 A Luristan bronze finial of the ‘Master of the Animals’ type. The central anthropomorphic tube with a Janus-head’ prominent nose and ears, holding off a snarling beast on either side. The Master of the Animals was a supernatural protector of game, the ruler of the forest, and the guardian of the entire animal kingdom. 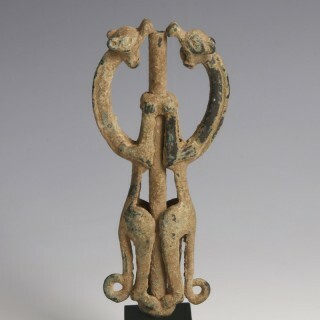 It comprises a human figure standing between the heads, necks, and stylized bodies of equestrian creatures presented in profile. The figure grasps the animals in what some have seen as an image of control. 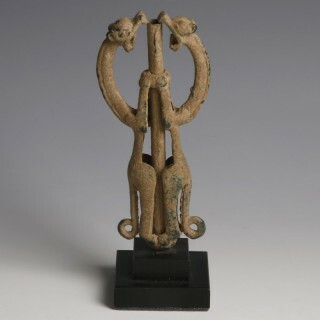 One of the mysteries of antiquity, their function is not known, but suggestions range from the religious – depictions of deities, idols, talismans, etc. 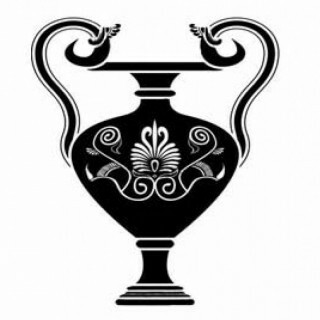 – to the utilitarian – adornments for chariots or articles used in funerary rituals. Condition: Fine condition with some patination and earthy encrustations on the surface. Mounted on a custom made stand.